Fort Wayne is a city known by many names including The City of Churches, Magnet Wire Capital of the World, Summit City, and The City That Saved Itself. 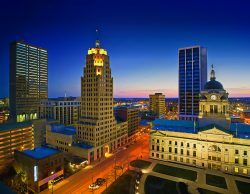 Fort Wayne is not only the hub of three rivers, it is also a major metropolitan area and the second largest city in Indiana. This city has many claims to fame. Fort Wayne played host to the first professional baseball game ever played on May 4, 1871. The game was a fierce battle between the Cleveland Forest Citys and Fort Wayne’s own Kekiongas. In what is now known as Headwaters Park, the nation’s first nighttime baseball game was played in 1883 under the lights. It is also credited to be the birthplace of the NBA, as Pistons’ coach Carl Bennett brokered the merger of the BAA and the NBL in 1948 from his Alexander Street home. Fort Wayne is home to three minor league sports franchises: the ECHL’s Fort Wayne Komets, the Midwest League’s Fort Wayne TinCaps, and the NBA G League’s Fort Wayne Mad Ants who are owned and operated by their parent club, the Indiana Pacers.The city hosts a variety of cultural festivals and events annually. Festivals commemorating ethnic food, dance, music, and art include Germanfest, Greek Festival, and Japanese Cherry Blossom Festival. Howl2GO by Howl at the Moon is the premier name in Dueling Piano entertainment. Bring our incredible performance to your event in Fort Wayne at any venue. When you bring Howl2GO to Fort Wayne, you can be certain you’re getting the true Howl at the Moon experience, and with that comes the assurance you are booking only the best dueling piano performers in the country. Our fun, energetic performers are perfect for all events anywhere in the Fort Wayne area. Howl2GO Dueling Pianos by Howl at the Moon brings only the absolute best entertainers to your event. Whether you’re planning a corporate event in Fort Wayne, a wedding or private party at your home, we’ll deliver customized entertainment leaving you and your guests dancing and singing along all night. We are the first choice for all types of school, church and charity fundraisers and we ensure all our songs and material is suitable for everyone in attendance. Telling your guests in Fort Wayne that Howl at the Moon is providing the entertainment, is a sure fire way of attracting more people to your event! Howl2GO is the only dedicated Dueling Pianos company in Fort Wayne and our team works tirelessly to ensure your event is perfect. Our production team will deal directly with your Fort Wayne venue and, in conjunction with our Wedding Specialist, sales director and our amazing piano players, create a customized event just for you. Our Howl at the Moon musicians will take you guests’ requests live just as they do in one of our many nationwide venues. We are a perfect choice for your wedding – we keep numerous couples in Fort Wayne and their guests dancing all night, as well as taking care of all your ceremony, announcements and special family dance needs. Don’t risk booking a local fly-by-night company that may not even still be in business when your wedding date comes around, nor one that hires freelance players. Howl at the Moon has been rocking since 1990 and our reputation precedes us. We have a dedicated reviews page so you can read testimonials from hundreds of our thrilled clients in Fort Wayne. Our Facebook page features regular updates, and following us on Instagram and Twitter means you’ll stay up to date on where we’re playing next near Fort Wayne IN.